Batter and Beat: All this cake is going to my bundt! So I've been on what you would call a bundt cake streak. Since the holidays began, I have probably made about five or six of these bad boys (so simple, yet still decorative!). I usually opt for the chocolate variety, but today I'm going to make a blueberry-lemon bundt as a little welcome back gesture for a friend. My friend has been in Argentina for the last month and was recently married in her hometown. Lemon cake is one of her favorites, but the poor girl had been on a major diet in preparation for the wedding since last summer. For six months, I went on my weekly bagel dog runs solo and she refused all sweets during our various pastry weeks at work. I was really starting to miss my old friend. Well, her willpower and all that dreadful exercise paid off because she looked AMAZING in her wedding dress! She also assured me that the diet would be over immediately following the wedding...phew. Preheat oven to 350 degrees. In a bowl, whisk 2-1/2 cups flour with baking powder and salt; set aside. 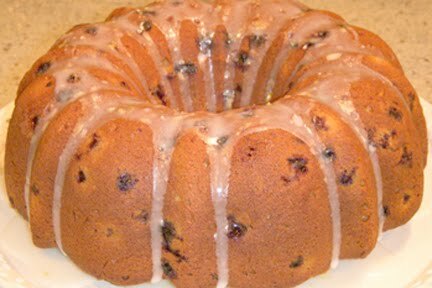 In a bowl, toss blueberries and zest with remaining teaspoon flour (this prevents blueberries and zest from sinking to the bottom of the pan); gently fold into batter. 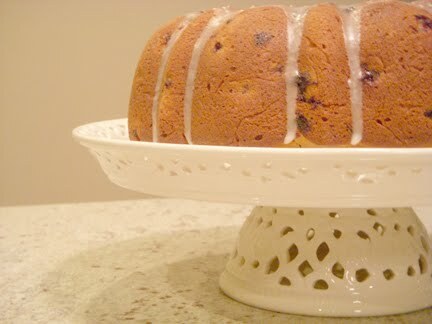 Coat a 12-cup nonstick Bundt pan with cooking spray. Spread batter in prepared pan. Bake for 60 to 70 minutes, or until a toothpick inserted into center of cake comes out clean. Cool in pan 20 minutes. Invert onto a rack; cool completely, top side up. Dust with confectioners' sugar before serving, if desired. The recipe actually calls for a dusting of confectioner's sugar, but I prefer a glaze. Combine both ingredients in a small bowl and whisk together until smooth. Poke holes along top of cake using a wooden skewer. Drizzle over cake. This is a very delicious cake. So moist and tender. It was better than "CATS". One of Dawn's finest creations!